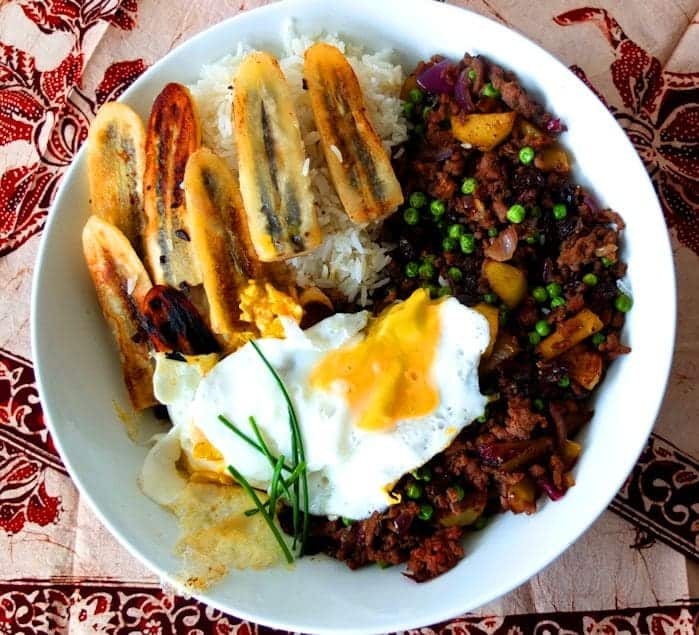 Arroz Cubana is what this delicious Filipino Cuban-Style Rice is called and has everything that you look for in comfort food. It is meaty, flavoursome, sweet, full of different textures and satisfying. My English/Lebanese husband asked me why I have never cooked this for him before. To be honest I do not know why. Versions of the popular dish can be found in various territories that were once occupied by the Spanish. 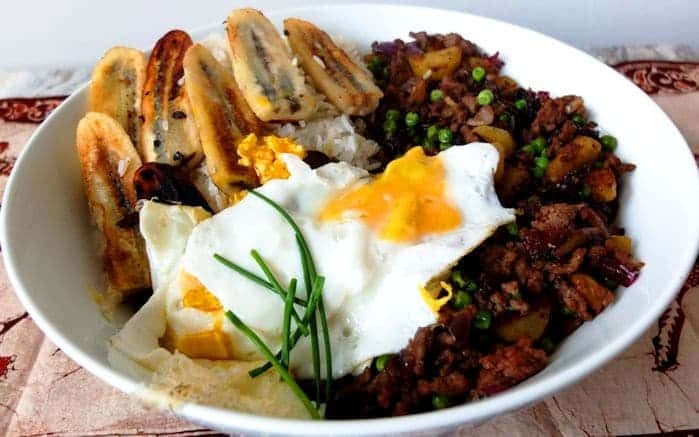 When anyone asked me to describe Filipino cuisines, I always tell them it’s “Asian cooking with Hispanic influences”. I think it is closer to Latin American cuisines because the climate and so the ingredients are quite similar. 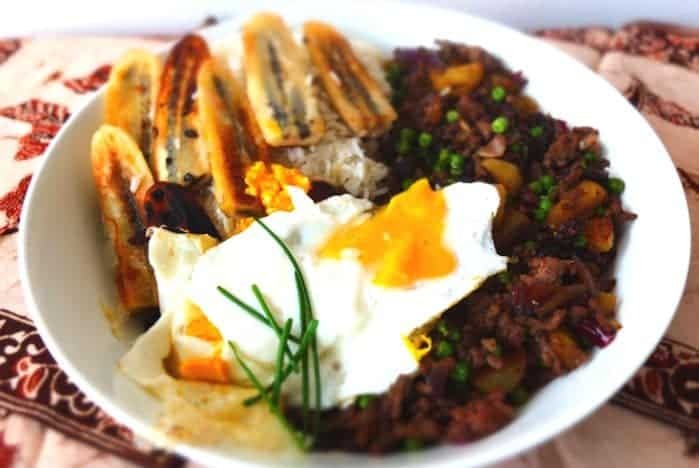 The best way to serve this is on a large dish where everyone can help themselves to the various ingredients that create this Filipino arroz cubana. Heat up 1 tablespoon of oil in a large frying pan. Add the garlic and sauté until lightly browned. Add the onion and sauté until translucent. Add the minced beef and cook over a medium heat for 5 minutes or until cooked. Transfer this into a bowl and set aside. Add another tablespoon of oil to the same pan. Add the potato and sauté for 10 minutes until browned. When cooked add the meat mixture, green peas, raisins, soya sauce , salt and pepper and cook for another 5 minutes. Now set this aside on a plate and keep warm by covering the plate with foil. To the same frying pan add another table spoon of oil and fry the bananas on each side for 5 minutes or until lightly browned. Add the bananas to the plate with the meat mixture. Now heat up the last tablespoon of oil and fry the eggs sunny side up.